Brea, CA, February 20, 2019 --(PR.com)-- Thump Records is starting the new year with a lot of passion through the release of powerhouse Frenchy Valens’ soulful rendition cover of “Sabor A Mi” on February 8, 2019. 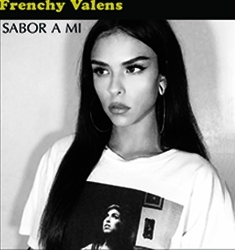 Formally known as Frenchy Made, Frenchy Valens is back and ready to showcase her vocal abilities with her version of the Latin classic single. Born as Lexis Janay Aguilar, this 24 year old, exotic beauty launched her professional music career in High Desert. And this was after she became homeless and was forced to drop out of college. This difficult experience motivated Frenchy Valens to pursue her passion and follow her dream with a “nothing to lose” attitude. Frenchy Valens early on embraced her multicultural heritage; being Mexican, French, Spanish, and Native American. As a teenager, she began writing music, taught herself to play guitar, and drew upon wide variety of American, Latin and international artists for inspiration. She credits Mexican-American singer Selena and English singer Kate Nash as her premier musical influences. Although she signed with Thump Records, as a pop/alternative/hip-hop artist, she continues to show off her rhythmic versatility by fusing in that “feel good” Oldie sound to her musical style. Aside from singing, and songwriting, Frenchy Valens also do rap, acting, and modeling. The “Sabor A Mi” package includes an original mix, a vinyl version, an acapella mix, and an instrumental version. It’s paying off...underground internet radio stations worldwide are already hooked on her single. Watch out for an explosive new video that will soon be released. Thump Records is distributed by Caroline through Universal Music Group.